SCVHistory.com | People | About Betty Houghton Pember, 1980 SCV Woman of the Year. 1980 SCV Woman of the Year; 1985 SCV Historical Society President. Betty Louise Houghton Pember (April 11, 1921 - Sept. 5, 1992), a third-generation Newhall resident, was named SCV Woman of the Year in 1980 and served as president of the Santa Clarita Valley Historical Society in 1985. She is buried at Eternal Valley Memorial Park in Newhall. Back of 3½x5-inch photograph reads: "Betty Pember as a teenager." Click to enlarge. 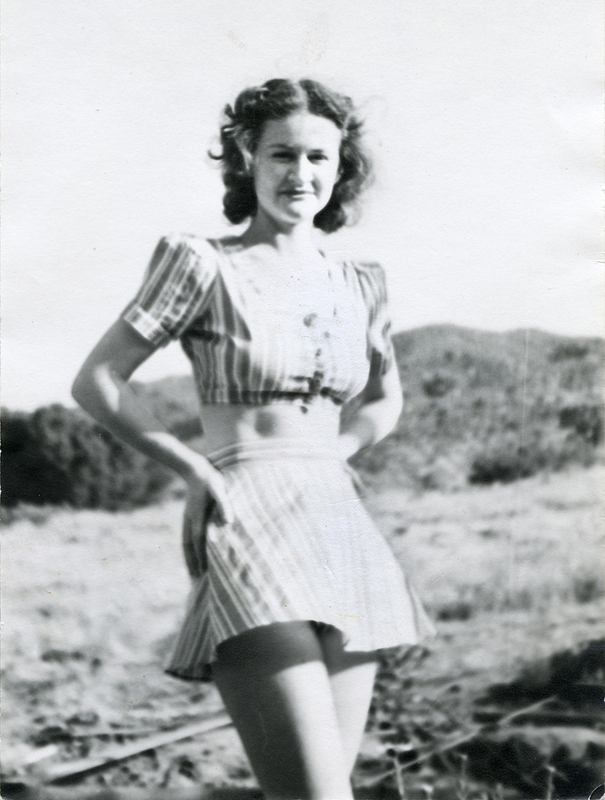 Her roots run deep in the Santa Clarita Valley. Her maternal grandfather, William Mayhue, farmed on Newhall Land and Farming Company property at what is now the site of Our Lady of Perpetual Help church. The Newhall Pharmacy was owned by her paternal grandfather, William Houghton. This brought her father, W. Lloyd Houghton, to Newhall in 1919 after serving in World War I. He married Opal Mayhue. Later he was to be Honorary Founding Member of the Santa Clarita Valley Historical Society. Betty was born April 11, 1921, in Newhall at the Hapalan [Hap-A-Lan] Community Hall, formerly her grandparents' general store, at the corner of Market Street and Railroad Avenue. It was a building like many in the West with living quarters in the rear. With no high school here, when the time came, Betty went away to boarding school, coming home only on weekends and summertime. 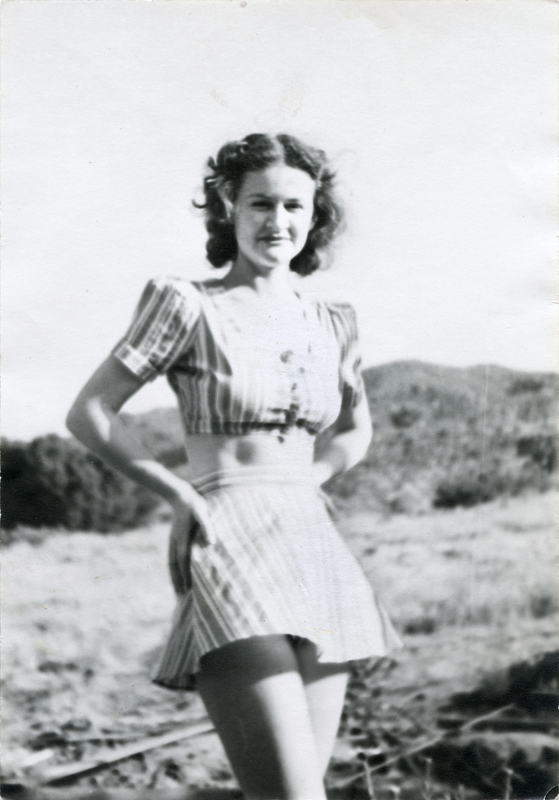 After graduation she lived with an aunt in Beverly Hills, not to return to this Valley as a resident until 1957. She lives an active life, as attest the many organizations in which she has served: Pocohontas, state chairman of American Legion Auxiliary Girls, Native Daughters of the Golden West, Newhall Women's Club [sic, s/b Woman's], Daughters of the American Revolution, president of Friends of Hart, board member for Committee on Aging, the planning committee for Senior Citizens Center, and once she was Newhall's Woman of the Year. For this Society she was on the first nominating committee, was a charter member, often a Board member and Landmarks chairman. Undaunted by impaired vision, with an ever-infectious laugh, Betty is a great motivator with the ability to get things done.